I came to the conclusion a while back that there isn’t a vegetable that’s not better roasted. I backtracked a bit, not just because that idea was too many double-negatives in one sentence, but thought that peas probably aren’t better roasted. I haven’t tried them; the idea of tiny peas being reduced to a shriveled bb’s doesn’t sound appealing to me. And while I know a lot of people like to roast radishes, boasting that they’re better than fresh ones, don’t believe them. Then I go nuts with it, and try to eat it as often as I can before it’s gone. I tend to roast asparagus, but I do like it steamed as well, especially when it’s tossed in a very flavorful dressing, like this one. Sure, you can now find asparagus all year ’round, but I wait until spring when it’s truly in season. Someone recently asked me if it was necessary to peel asparagus. First off, let me say that some people like those pencil-thin spears of asparagus, but I prefer the big, wide fat ones, that are nice and meaty. The thin ones can be chewy, in my experience, although they usually don’t need peeling, so you save on that step if you’re not up for it. Another question that comes up is whether white or green asparagus is better. 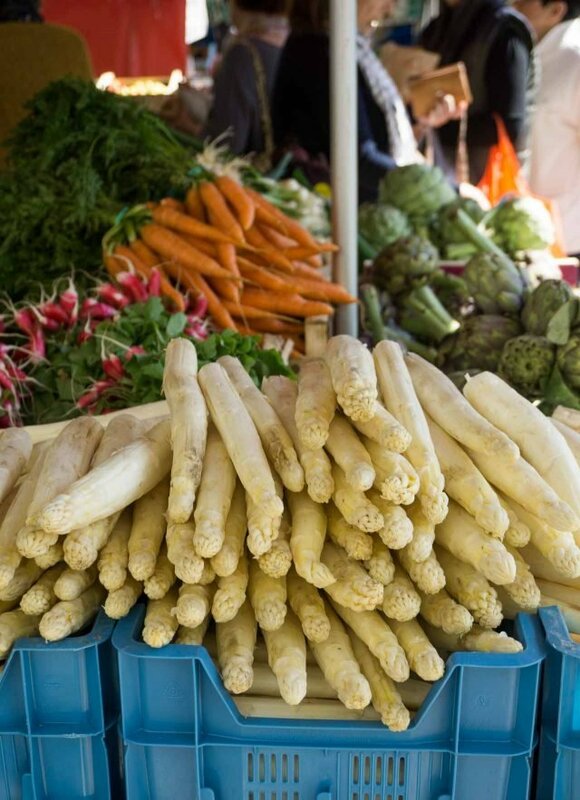 For years, Americans felt deprived because we didn’t have white asparagus. And in France, green asparagus was more the exception, rather than the rule. Over the last few years, there’s a lot more green asparagus in France, probably because some of it comes from other countries. 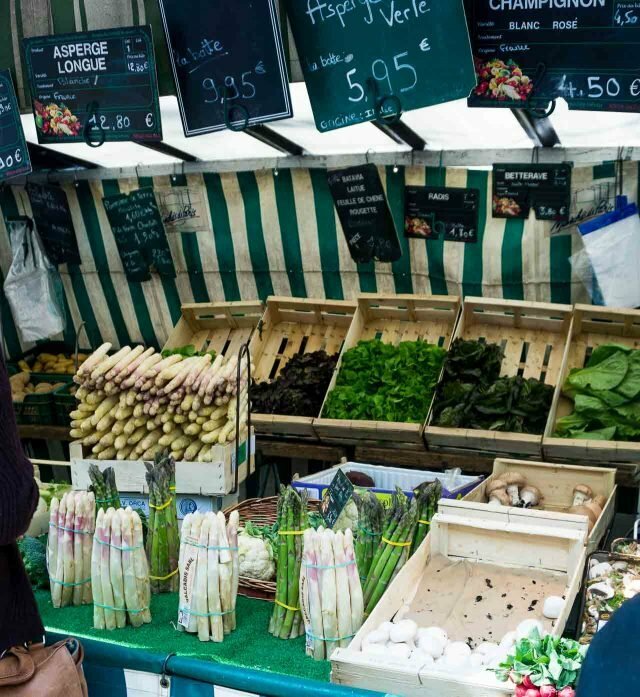 But there’s French-grown green and white (and sometimes purple) asparagus at the markets, so you can take your pick. White asparagus is more perishable and doesn’t keep as well. It tends to be softer when cooked, and sometimes white asparagus can be bitter, which I’ve never experienced with green asparagus. But like our neighbors in Germany who love their spargel (isn’t that one of the best words, in any language? ), white tends to get more press, and space at the market. Speaking of France, the word “mimosa” means with hard-cooked eggs, and this recipe not only gives you a chance to give your vegetable peeler a workout but is also the time to hone your knife skills to cut the egg into little cubes. They don’t have to be perfect (which would be hard, since eggs are rounded) but they look nicer in the sauce and on the asparagus when they’re diced, rather than hacked away at, although they can also be shaved using the large holes of a cheese grater, too. But in this instance, I say go for the cubes. In addition to peeling asparagus, and every once in a while someone asks me what’s the big deal about flat-leaf parsley. The deal is that is has a lot more flavor than curly parsley, so that’s what I always use. Now that we’ve gotten all those questions out of the way, I should let you know that I like to prepare the sauce and “add-ins” separately, then mix them together at the last minute. I like them to remain a little distinct until the last minute, and I reserve some chopped parsley and eggs to strew over the top so they’re not lost in the mix. Lastly, this is a hands-on dish, and by that I mean that using your hands ensures that the dressing coats the asparagus, which you can ascertain by feel. Oh, and speaking of which, a while back, somewhere I mentioned that the French don’t usually eat things with their hands, but use a knife and fork. It often surprises Americans to see French people go at a burger with knives and forks, and New Yorker’s go apoplectic if someone doesn’t pick up pizza to eat it. But someone sent me a message that they were visiting France and saw someone eating something with their hands (I think it was a baguette sandwich? ), so I was wrong. There are, indeed, some things the French eat with their hands, and that includes asparagus. (And baguette sandwiches.) So while I have strong feelings about peeling asparagus, feel free to eat the spears however you want. Although for these, I’d stick with a knife and fork. This makes 2 main course-sized servings. You can easily double the recipe to serve more. Capers should be rinsed before using, and squeezed a bit to remove excess water. If you're interested in learning how capers are grown and preserved, check out my post, Capers in Pantelleria.To hard-boil the eggs, slide the eggs into a small saucepan of gently boiling water. Let the eggs cook for 9 minutes. Drain the water out, add ice to the pan, and some water, to cool them down quickly. I find that shaking them a bit in the water, encouraging them to crack a bit, makes them easier to peel.You can certainly modify the herbs to your liking. Tarragon, chives, or marjoram would also be nice added to replace some of the parsley. 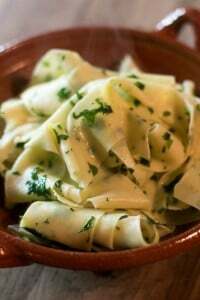 I've been known to add a couple of minced anchovy filets to the dressing as well. 1. 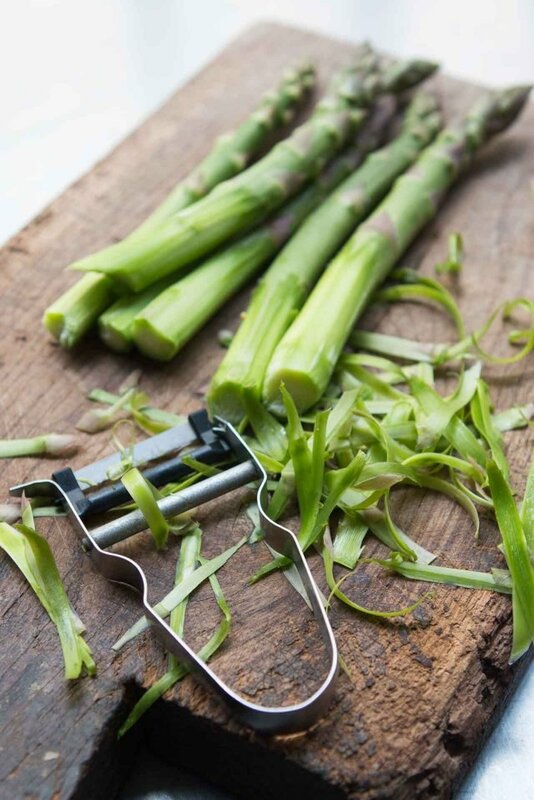 Hold the asparagus at both ends and snap off the tough stem ends. Usually the tough stem will part with the tender part of the asparagus spear in just the right place. 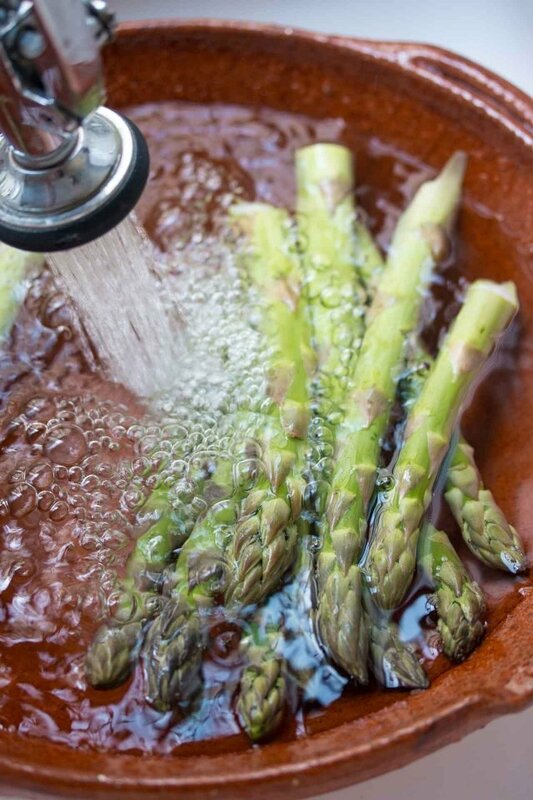 Submerge the asparagus tips in water to remove any grit. 2. Prepare a wide bowl of ice water and set aside. Steam the asparagus until tender. Usually it takes 5 to 6 minutes for thick spears, although best to check before those times since you don't want overcooked asparagus. The tip of a paring knife inserted into the center of a spear should meet little resistance. 3. Remove the spears from the steamer and plunge into the ice water just until cool, then remove and let drain on a kitchen towel. 4. 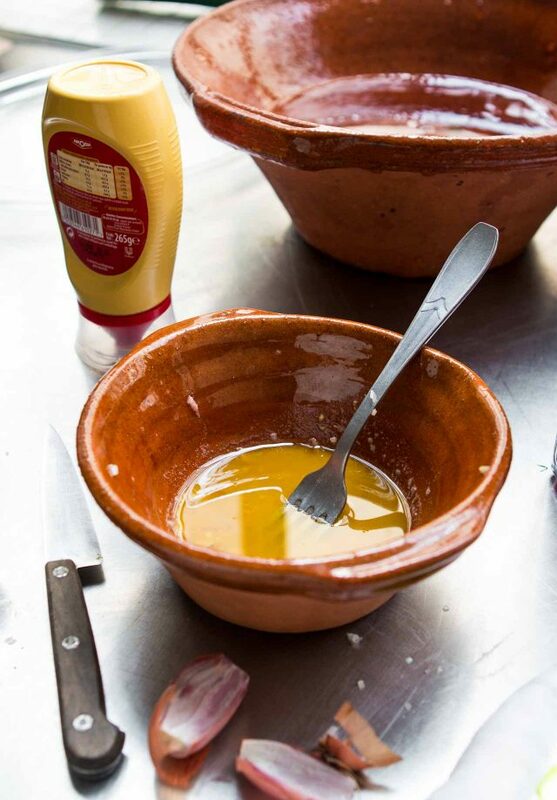 In a small bowl, mix together the vinegar, salt and shallots with a fork. Let stand 2-3 minutes, then add the mustard and olive oil. Stir well to combine the ingredients. 5. Peel and dice the hard-cooked eggs. 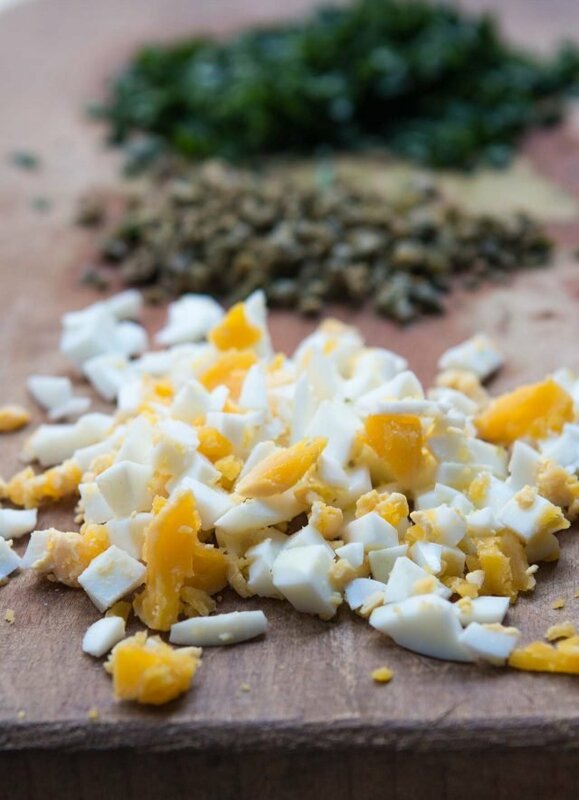 Add the capers and about three-quarters of the parsley to the dressing, as well as three-quarters of the diced eggs. 6. Place the asparagus on a serving plate and pour the dressing over the spears. Use your hands to coat them with the dressing. Sprinkle the rest of the parsley and eggs over the top. 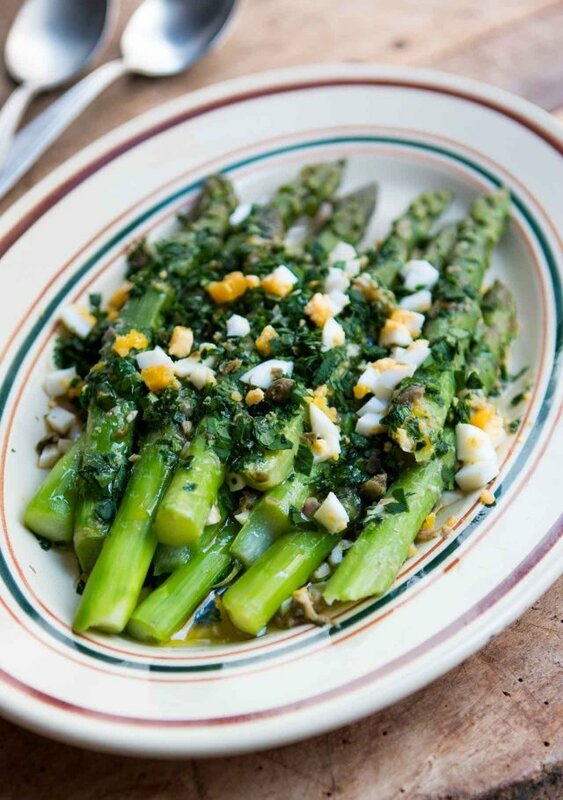 If the asparagus has absorbed a lot of the dressing, drizzle additional olive oil over the top, and serve. Asparagus and eggs are a match made in heaven (asparagus omelettes are great, too). Down here in Aude, green asparagus dominates. There are camionettes at nearly every intersection on country roads, selling asparagus that was picked earlier in the morning. You can tell the fat ones are better because they cost more. However, the most expensive (and I’ve foraged for them myself and can understand why) are wild asparagus, which are extremely thin. I can’t wait to try this recipe. A week ago, I made some green asparagus brought back from Italy and “enrobed” them around the middle with roasted hazelnuts, a small amount of chopped dried cranberries and lemon zest, and some excellent olive oil. White versus green? 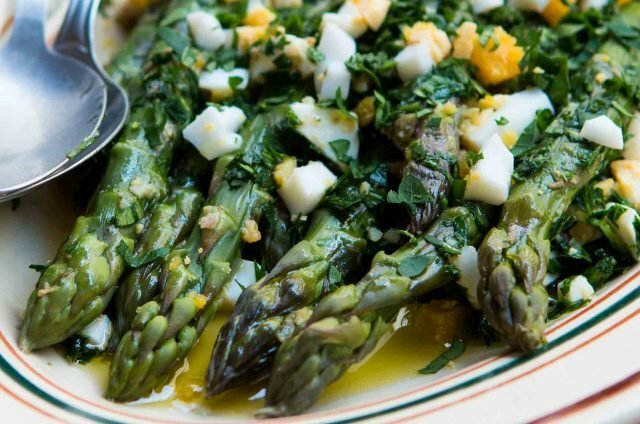 The best aspargus dish I’ve ever had, served in a French restaurant, was white, but my experiences cooking the white have been middling at best, so “vive les verts”. David, what kind of a peeler is that? I have never seen one like it – very nice. Also – the easiest way to cube the egg is with an egg slicer. Put the egg in one way and then rotate it and slice again. They’re called Y-peelers and are (I think) more popular in Europe than in the States. They’re good for some things, but not others. Interestingly, I saw a vintage egg slicer at the flea market this morning and considered getting it! I have one. Plastic and stainless steel. A gem. Turn egg one way to slice; then carefully lift it out, keeping slices together, and place it back in the slicer so that the next cut creates little cubes. Wonderful! As for the peeler, every kitchen used to have a version of this. That metal hook-looking thing intended for removing potato eyes. We were treated to white asparagus in a vinaigrette years ago when a wine negociante friend entertained us at lunch in Bordeaux. Lovely stuff – big fat spears. All the local specialties, seafood, the works, up the fresh fraise de bois for dessert… Yum. Isn’t it wonderful when special meals live in memory? 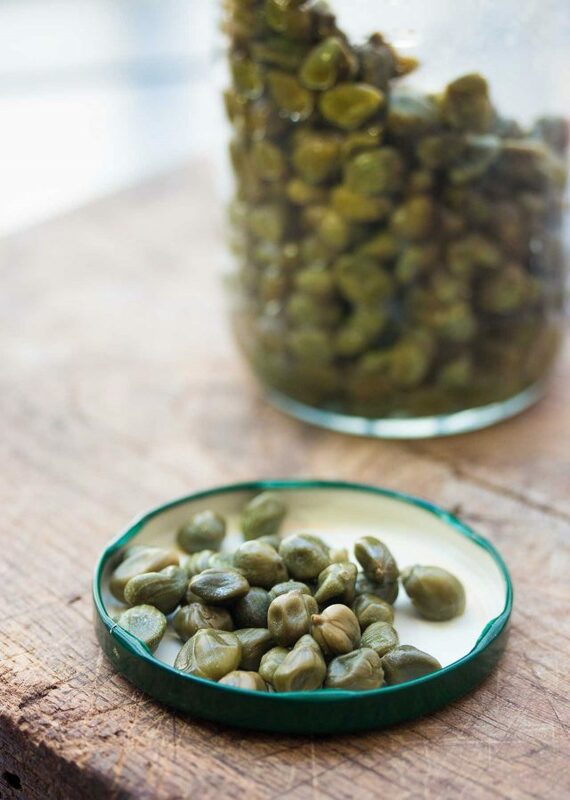 What kind of capers do you buy? Can you give any advice on type and should they be rinsed? Although you can buy capers in most stores, it’s hard to say how you can tell the quality of capers before you buy them. If there is a shop where you live, they might have ones in jars or in bulk from Italy, Spain, Greece, or other places capers are grown. The ones you buy in the jar at the supermarket aren’t bad, but tend to be pretty salty. Either way, I always rinse capers and give them a squeeze to remove excess salt/brine. In the U.S., Market Hall Foods, Corti Brothers and Zingermann’s are both good places to buy best-quality ones. I love peelers like that one, I find them easier to use. I never tried asparagus until a few years ago then realized what I was missing. They were out in full force the other day, better pick some up. This recipe looks delicious. Mimosa means with eggs? Just when I thought you’d managed to make an asparagus cocktail!:). This looks absolutely delicious and I will be tucking it away for the next NZ asparagus season (many months away, alas). 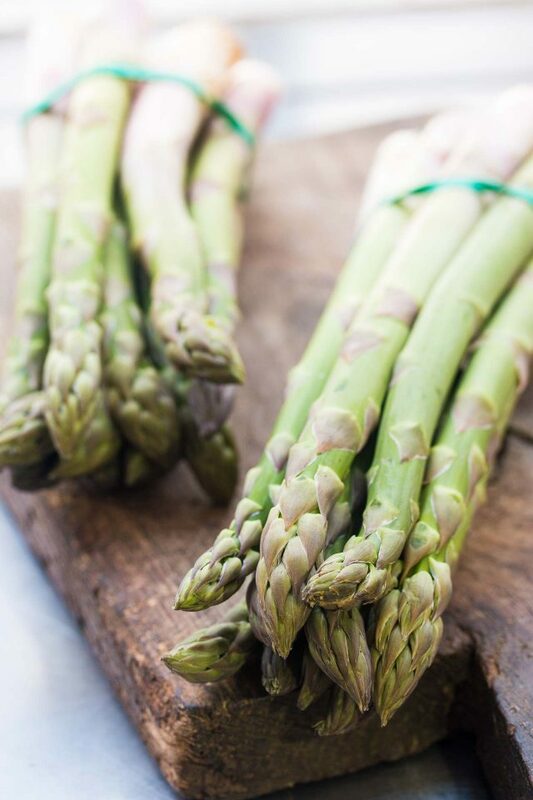 I only eat asparagus when in season too – one year I made a lot of asparagus soup and froze it so I could enjoy it in winter, but it just didn’t feel right eating it at the wrong time. 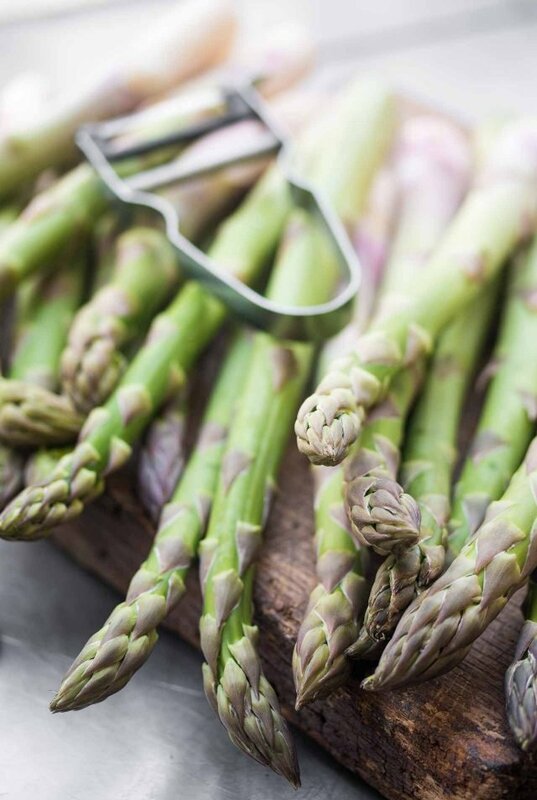 NZers are asparagus crazy (the approach of the season is greeted with Beaujolais Nouveau-type fever) and try and cram in as many asparagus dishes as possible during the season, so another recipe for the collection is always welcome. How many of us opened this up wondering how you incorporated the asparagus into the champagne and orange juice? My mouth is watering over the real dish, however – and these are just coming into season here in Kentucky! Living in a citrus heaven (Southern California) and influenced by David’s frequent cocktail posts I had the very same thought. Then I thought maybe it would be a citrus-based vinaigreytte with champagne vinegar. Nope? 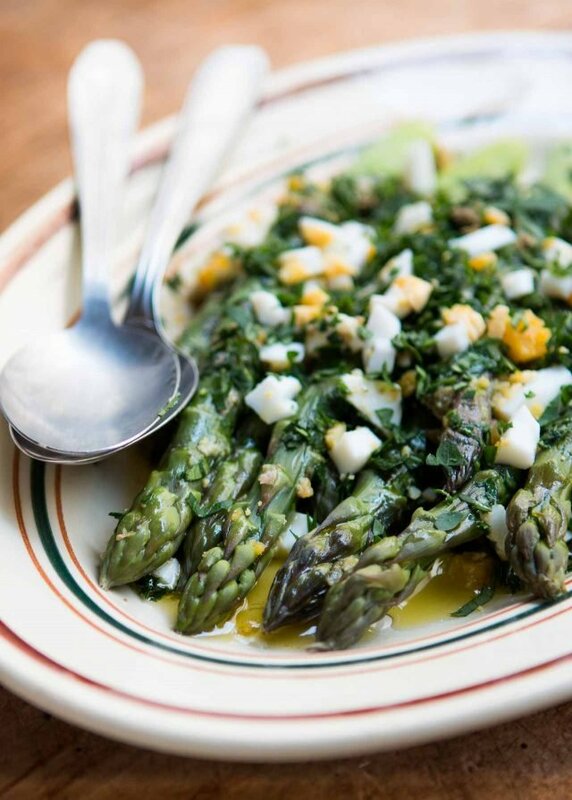 We’ll diced eggs and asparagus sounds dreamy, too. Delectable! White asparagus in France so much better than the thin, bitter, stringy ones in the States. No better lunch than the fat juicy French ones with steamed artichokes and potatoes. We do the eggs too, sometimes adding plump Southerns pecans I have brought over from the States. Tried to post a photo. I started using my Sous vide device for veggies. Asparagus at 180 degrees for 10 min is perfect. My next batch will definitely be sauced mimosa style. Actually sounds good for breakfast!!! I just saw this comment as I was getting ready to cook some asparagus for dinner tonight. I tried your method and it was amazing! Do you have a trick for getting the asparagus to submerge? I tried everything and it was so light I couldn’t get it to stay under water. You can push the egg yolk through a sieve to get very fine grains. The white has to be chopped though. Guess that wouldn’t be a really good drink anyway. The recipe looks like a definite winner. white asparagus should be big and fat so that ladies blush and limp so that gentlemen are ashamed. Old Russian suggestion. So good to know about roasting radishes – never thought to do this! I’ve always thought there had to be more to them than raw or pickled…plus the raw with butter thing sadly does not appeal to me so I will try roasting a bundle or two and see how this goes! Thank you! Glad to see this was “Asparagus Mimosa” and not “Asparagus Mimosas”, but right up there with another favorite of mine, Asparagi alla Bismarck– fat spears of steamed asparagus topped with a fried or poached egg. I too love the word spargel. We were in Germany a couple of years ago during asparagus season and there were spargel zeit, “asparagus time”, signs everywhere on the roads. Just seeing them made me happy. Of course we had to have lots of spargel while we were there. I had this dish last spring at a restaurant in NYC. The chef had added chopped toasted almonds, and now I can’t make it any other way! The title got my attention, the photos made me drool! Thanks, David, these will be great for my upcoming brunch. That looks fab – thank-you for sharing!! We are at the very beginning “Spargelzeit“ here in the cold North – for now I’m sticking to the cheapo “Suppenspargel (“Soup Asparagus “) which is leftover bits and pieces, but still top notch – at a fraction of the price. We are so lucky to live 2 km from a small grower who is really into producing the best asparagus possible (followed by the best strawberries). The second the green Spargel shows up, I will be making your recipe. In the meantime, it’s white – roasted, steamed, boiled, grilled, with hollandaise or just butter (the salted kind from Bretagne, natürlich) in fritattas, quiche, on pizza, raw, whatever. The season here is very short, so we eat as much as possible and somehow don’t get tired of it! Perfect timing! I just picked my first “fat” asparagus from the garden. I will definitely try the recipe as it looked really interesting and different from the way I usually either BBQ or steam them. Suggestion, I have your cookbooks and really enjoy them. How about one that incorporates dishes like this one? As far as the ‘Fat’ vs ”Thin’ asparagus goes I only know what my father told me. (He worked over 40 years for Green Giant Company and the plant in Dayton Washington USA processed more asparagus per hour than anywhere else in the world). Anyway he said that there was a ‘string to flesh ration’ and that as the larger asparagus had less string to flesh ratio. I always buy the largest asparagus as I can find. I also clip the ends off, put the asparagus in fresh water and then refrigerate it. Asparagus is like a flower and it needs water. After it’s well hydrated I grab just below the tips and at the end and ‘Snap’ the spear. While there is some waste (unless you use the butts for soup) it leaves you with the tender part of the spear. Thanks for the recipe, I will give it a go. I was trying to think when I’d first made mimosa from hard-cooked eggs. 7th grade cooking class. A long, long time ago. 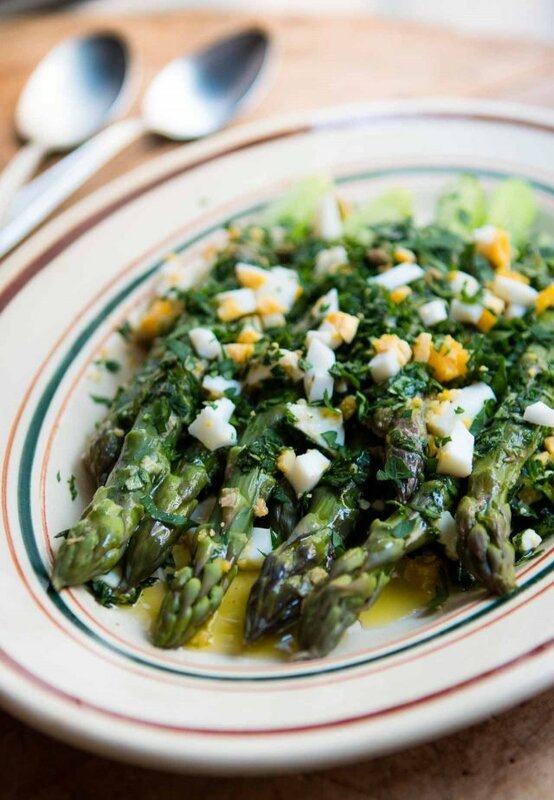 This is the epitome of spring on a plate, such a perfect meal. 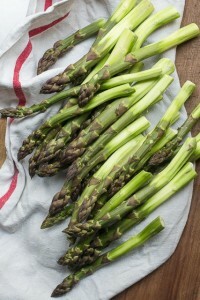 I have had white asparagus several times and although i certainly enjoyed it i prefer the bolder flavor of green asparagus. Thank you for this recipe! I will be making it tomorrow. It looks fantastic. My favorite go to recipe is to roast the asparagus with a mixture of browned butter and soy sauce. Exquisite…but love this new option. The eggs will be a great combination! Thanks again. I must confess I didn’t open this for days because I thought an asparagus cocktail was not for me. 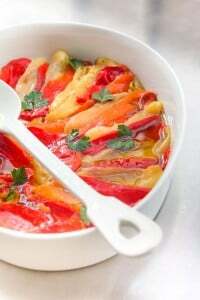 This, however, looks delicious and I will give it a try as soon as the local asparagus comes in. This was one of the few dishes my grandmother made but she upped the ante with a handful of fresh breadcrumbs browned in butter – that might turn the mimosa into a polonaise – but a little crunch elevates the dish. Dear David, although the cooler days of Autumn are here in NZ, my local greengrocer has really plump Californian asparagus in stock. This looks so inviting,I’m tempted to bite the bullet on the cost, and make this for dinner. I worked as a prep hand Foran upmarket caterer in Toronto, in the 80’s. One of my jobs was to peel, blanch, then tie with chive bows 600 servings of asparagus. [it was the 80’s!]. I now compulsively peel every stalk that crosses my kitchen bench. It’s 5minutes work, and it makes the whole stalk edible, after cutting a smidge off the base. About roasted vegetables, I had some delicious roasted peas—in the edible pod—at a little Scandinavian bar in NYC a few years ago. Don’t know if they blanched them first, but they were just oily enough and scorched outside, with fat, plump peas inside, sprinkled with coarse, flaky salt. Yum! I deep fry the peels for garnish, delicious! I made this as written. But, of course, added anchovies. DELISH! My money is on roasted Brussel sprouts and beets. Then again it may just be that my wife has burned me out on asparagus. This looks like a yummy recipe to try. I’m always up for trying new things with asparagus. Wanted to let you know I heard you on the Christopher Kimble radio program the other morning, on, of all channels, KWMR, out of West Marin, probably Point Reyes! It comes in loud and clear here in Sonoma! You sounded great and I got a few chuckles. I read L’Appart and thought it was the best. Asparagus Mimosa prepared in a boat galley! And it was a real success. We’re in remote British Columbia heading to Alaska and prepared this recipe Yes to go with fresh halibut last night. It was perfect. We’ll be fixing it again during our 3 month voyage and it will be a staple in our home kitchen when we return to the Seattle area in August. A real keeper!